The first boy disappeared on the day of his birth, on a night when the pale yellow moon of the nighttime sky turned red and bathed the heavens in the ghastly color of blood, on the same night the Kingdom of Cokyri abruptly ceased its merciless attack. Across the land of Hytanica, under the shadow of the crimson moon, infant boys continued to vanish. Not until the blood had faded from the sky did the disappearances stop, and the bodies of the murdered infants were found outside the gates of the city, a final word from the greatest enemy Hytanica had ever known. For the next sixteen years, peace reigned, but one mystery remained unsolved. The Cokyrians had abducted forty-nine newborns, but returned only forty-eight bodies. Now, as seventeen-year-old Princess Alera of Hytanica is besieged from all sides by suitors vying for the Throne, a teenage Cokyrian boy, Narian, is encountered within the walls of her Kingdom, a boy who will show Alera a world where women serve a purpose and not just a husband. As Narian helps Alera find her voice, she struggles against an arranged marriage that will shatter the life she has scarcely begun to live. And when Narian's shocking past is uncovered, and war with Cokyri looms once more, he must fight to defy a fate ordained at his birth. If I had not already known that Cayla Kluver, the author or Legacy, was fifteen years old when she wrote this book, I would’ve never guessed after reading it. It was written in the tone of an older and more experienced writer, and I commend Kluver for a job done amazingly! Legacy is set in the fictional land of Hytanica, which years ago had been at war with merciless land of Cokyri. One night, the Cokyrians kidnapped 49 of Hytanica’s male babies, killed them, and left the bodies outside the city walls. Only 48 bodies were found. Seventeen years later, Alera, Princess of Hytanica, must find a suitable new King. The obvious choice is Steldor, the haughty and conceited son of the military leader. Alera loathes him, though, but this only causes him to try harder. I actually really loved Steldor. And then Narian comes along, the long lost son of a Hytanican baron, who had been raised in Cokyri. Narian changes the way Alera sees the world, and even herself. Alera’s relationship with both these boys was amazing. She has a love/hate thing going on with Steldor, where one moment she’s pissed beyond reason, and the next, he’s not being so bad. I actually really loved Steldor, and if Narian wasn’t in the equation, I would totally ship Alera and Steldor. Narian. I adored him. He’s strong, hardheaded, and unbelievably sweet. Just as Alera fell in love with him, so did I. I really, REALLY can’t wait to read the next book and see what’s going to happen between them. I mean, with how Legacy ended… Ahh! It’s definitely a nail biter. Legacy was an amazing read that I simply couldn’t put down. I was delighted to see that it was a large, thick book and kept me entertained for quite some time. Kluver manages to capture you from the very first pages. The plot was well-paced, and wonderfully written. This is definitely on my favorites list. 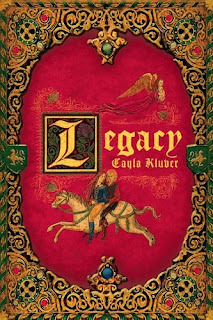 NOTE: Legacy will be re-released through Harper Teen sometime next year.